It’s always a strange one returning to your real home after travelling for a while. There are so many mixed emotions. 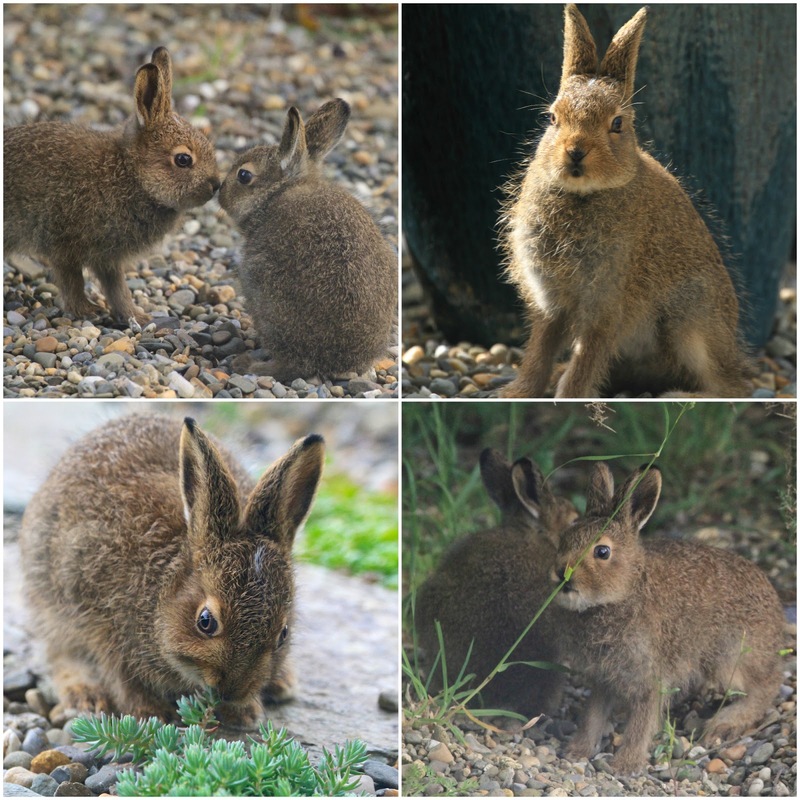 So when our resident hare family turned up with two babes it eased the transition. Irish Hares have lived in our couple of acres as long as we have been here. Since the land around us was cleared, this wild patch may be the only remaining cover they have for breeding. They usually join us for breakfast. Their mother returns to feed them from time to time but otherwise they are left to their own devices and forage in and out of the undergrowth. Leverets as these babies are called are put out to fend for themselves at a very young age. 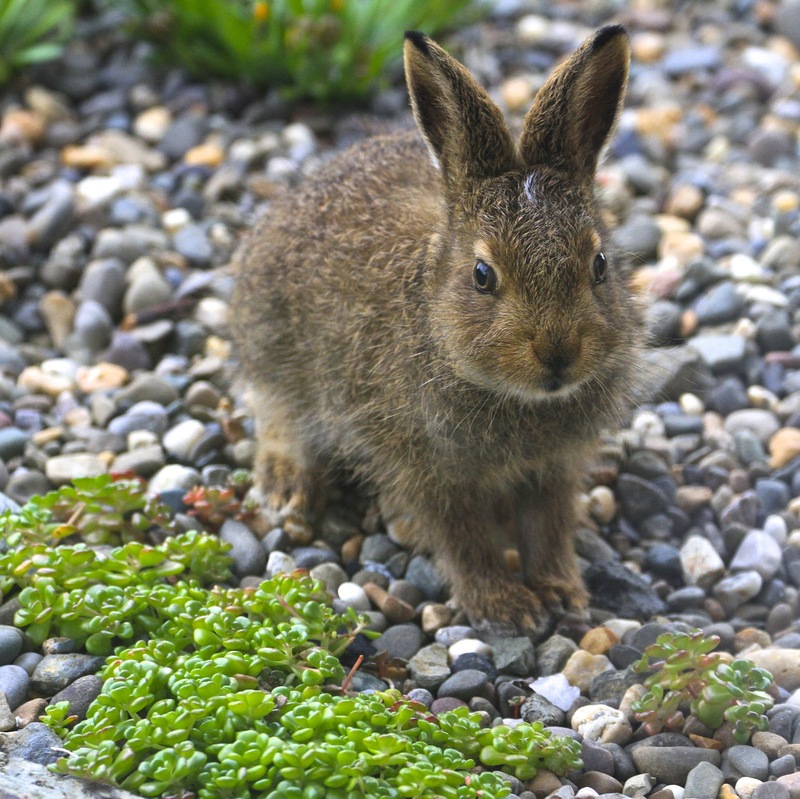 These two are tiny and vulnerable, nibbling at the odd bit of grass and gobbling up the more succulent patio plants. You may think they look exactly like rabbits but check out the huge back feet…..these are the give away! 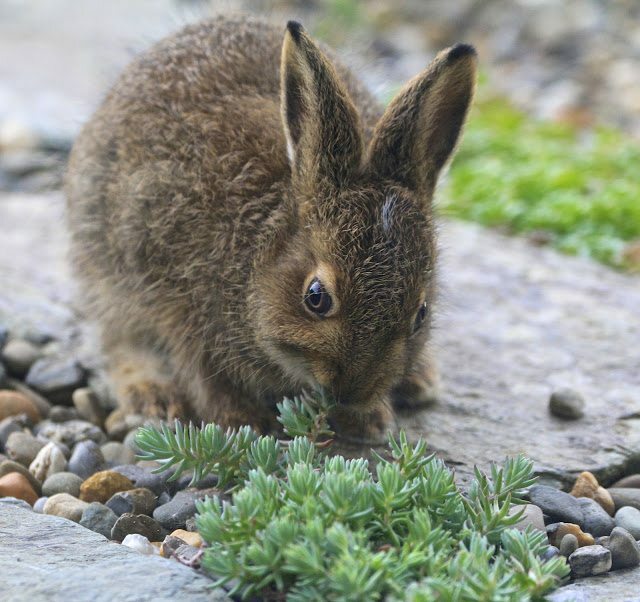 As they scuttle and hop around now they are fairly uncoordinated, but they will grow to be much larger adults than an average rabbit, the lanky back legs ensure that. The adults are magnificent creatures, full of mystery. They live alone and can sit for ages just staring into space, grooming or nibbling. I always imagine they are in a meditative trance ….. These images are absolutely adorable! Those eyes! Love! Thanks Robin, the cuteness of youth!! Sweet little ones! As always, I'm in love with your hare images. 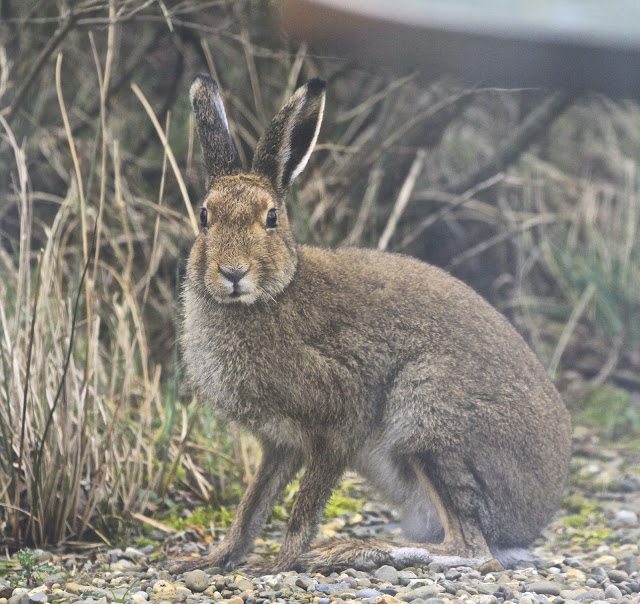 Sarah, I love coming home but I love leaving home too……I'm interested that you had a hare at your Irish cottage….I'd love to know if it happens more often than I thought. Catherine I adore your hares and the babes…different from our rabbits and yet similar in behavior…they are so precious to have living with you! There's just one thing Donna that I know you will empathise with…..THEY ARE EATING EVERYTHING IN THE GARDEN!!!! 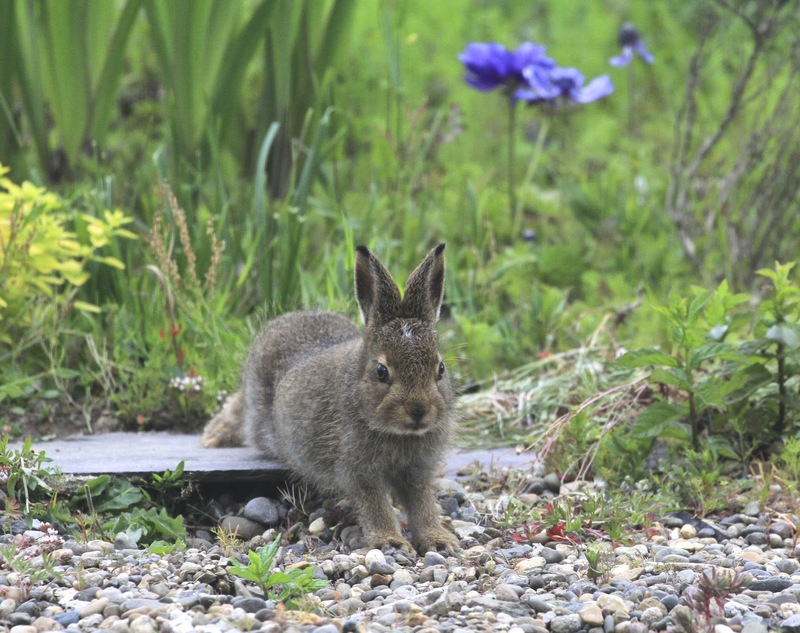 How lucky you are to have these hares in your garden – they are such beautiful magical animals. My younger son lives in the countryside in Suffolk and they also have hares in their garden. Thank you for that. It seems hares like living in gardens after all? Maybe it keeps them safe from predators? My little ones are thriving btw and the legs are getting longer each day! What a wonderful way to settle back into home life again Catherine. I understand what you are saying, it can be a disconcerting time. These lovely little leverets are so adorable and I love the photo of them rubbing noses like an eskimo kiss. Enjoy! I love travelling though and I'm already planning the next escapade. it's a funny old push pull isn't it? Thanks Jane, I'm delighted you enjoyed the leverets. Aw, how cute! And wow, those are impressive back feet! I'm guessing the little ones will grow into them somewhat. So glad they have a wild spot to live and play in.